We’d love your help. Let us know what’s wrong with this preview of Seeds and Trees by Brandon Walden. To ask other readers questions about Seeds and Trees, please sign up. I absolutely love the main title page - the flowers, thorns and bird are absolutely stunning. The art style felt unique yet beautiful, which is something I crave in picture books. I love seeing different art styles that connect with the story. An added touch was the letter from the author at the beginning. 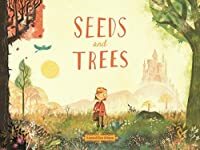 As a child, I probably would have skipped by it and not cared in the least, but as an adult I like reading into the mind of Seeds and Trees by Brandon Walden is a super cute illustrated story. The story itself worked well with the art style. The contrasting There was a bit of a rhyming scheme at certain points of the story, but it didn't feel super forced. This book has a nice lyrical quality to it. The illustrations are magical, and I think are superior to the story. I felt like some of the vocabulary was a little out of reach for small children, so I'm not quite sure who the intended audience would be for the book. I found the lyrical rhythm to be appealing, as well as the illustrations. I do not think this story would be interesting for young kids, they definitely would get lost and fast, but for my 5th graders it is definitely going to be a story we read and discuss. Great illustrations. A good book to open the way for discussions, though the message may be lost on some kids. Seeds and Trees - I liked it, I liked the concept, the idea and the lesson to be learned. I can't see it being a book that would be popular with children as it's very deep and something that often adults don't understand - the power of the spoken word or once a word is spoken, it cannot be taken back. Scripture talks about the tongue being a two-edged sword. Jesus said that, with it, we bless people and we curse people. 'The tongue can be like a two-edged sword when words are hurtful, degrading, Seeds and Trees - I liked it, I liked the concept, the idea and the lesson to be learned. I can't see it being a book that would be popular with children as it's very deep and something that often adults don't understand - the power of the spoken word or once a word is spoken, it cannot be taken back. Scripture talks about the tongue being a two-edged sword. Jesus said that, with it, we bless people and we curse people. 'The tongue can be like a two-edged sword when words are hurtful, degrading, dishonest, or slanderous. A two-edged sword cuts both ways and the swordsmen of bible times kept them very sharp' is a quote taken from an internet search. This book, if or when read to children, would be more of a teaching device where the parent could use it to help the child understand the danger of using their words indiscriminately when talking to their siblings or other children in their school environment. I think it would be appropriate for children from ages 7 and up with the understanding that younger children would need guidance to understand; however I doubt that most children would ask to have this book read to them. I love the imagery of the seeds spoken by people and the trees they grow. The story is well-written with so many opportunities for discussion. I really enjoyed this adorable children's book! The illustrations were beautiful and the message was clear to an adult reader. It seems an easy way to introduce the concept of giving life to positive thoughts and feelings rather than fueling negative ones. It definitely can start a conversation between a child and parent/caregiver! I loved reading this to my kids. It has a great message and they loved the story. The artwork was beautiful. This is one book I will gift everyone, because it can be enjoyed by kids, teens, and adults. Also, it is a perfect teacher gift. It's a great concept with lovely illustrations, an important lesson and a simple yet elegant metaphor. The writing could use a little editing, but it's certainly good enough to carry the message and the story is entertaining. An absolutely gorgeous combination of poetry and artwork, making a point worth considering at any age. This book features a young prince as the protagonist. He lives in a castle by the sea. Every day he goes out to collect seeds. The prince soon realizes that some of these seeds become dark seeds, while others remain green. As the trees he plants grow, the dark seeds develop thistles and thorns. The green seeds blossom into beautiful shade trees. The reader comes to understand that the green seeds represent good words that are beautiful and true, while the dark seeds represent harmful, cruel word This book features a young prince as the protagonist. He lives in a castle by the sea. Every day he goes out to collect seeds. The prince soon realizes that some of these seeds become dark seeds, while others remain green. As the trees he plants grow, the dark seeds develop thistles and thorns. The green seeds blossom into beautiful shade trees. The reader comes to understand that the green seeds represent good words that are beautiful and true, while the dark seeds represent harmful, cruel words. As the prince becomes older, he notices that the dark trees are overshadowing the others. One day he meets a young girl who always speaks true and kind words. She carries with her the tools to remove the dark trees. She helps him take care of and nourish the green trees while removing the dark trees. I really like the moral of this story. I realized at a young age the power of words. A lesson I never forgot. Everyone knows kids can be careless with what they say, so I like the idea of a book, at the very least, planting the seed that you should be careful what you say. I thought the way the other used "seeds" to get his point across was very creative. The illustrations were very nice as well. I did have a problem with wording a bit. It was, for me, a little repetitive and I found the rhyming I really like the moral of this story. I realized at a young age the power of words. A lesson I never forgot. Everyone knows kids can be careless with what they say, so I like the idea of a book, at the very least, planting the seed that you should be careful what you say. This was a really sweet poem book that spoke of being kind to yourself and others. I think this book would be helpful in the classroom, because it promotes positivity and kindness, I think it would be great to use if there were bullying happening in the classroom. This book would be great for parents as well, as it's message is to encourage your children, not put them down. this book was a beautiful metaphor, but i'm not sure it would work with a large group of young children. definitely a great book to read to elementary students about how the words they say can affect their friends and classmates beyond what they can see. As parent and therapist who specializes in trauma, I can't recommend this book enough. Great conversation starter for kids. Sticks & stones may break my bones, but words can hurt if you carry them with you. Make sure you read the letter from the author (aloud to children) first. A picture book about a prince who plants seeds out of words. Good words create happy trees and mean words create bad trees. The bad trees threaten to suffocate the happy trees until someone tells him not to plant and water the bad words. It's good advice I guess. Some of text rhymes, some doesn't. I’m not sure if this book is really geared for a younger child but it has a great message and will spark wonderful conversations between kids and parents. It is a great analogy about how we let negative things people say choke out the good things in our life. Well done! I know children are clever enough to understand the profound ideas in this book. This is also my story. So I'm careful with the words i give to children i encounter. 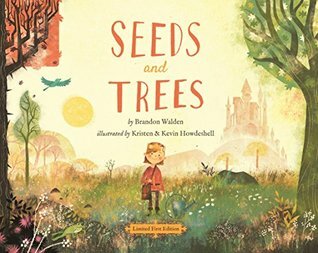 I loved how the words/seeds were planted and grown — this is a good story for teaching the power of words and how we nurture our thoughts, and how to release/let go of hurt in order to make room for all the good/green trees. Wow! What a story! It teaches you to love yourself and ignore that negativity that makes you loathe your inner being. The illustrations are spot on. This is a good read for all ages. A beautiful book with stunning illustrations. A really nice moral lesson to be learned here about nurturing and being careful how your actions affect others. Terrific work and would be happy to read more by this author. A really beautifully illustrated book with such a good and simple message at its heart. This is a great way to open the conversation with children, about how they can impact on the world and people around them. 2018. Traditional Literature picture book. This book depicts how words affect the world and the people around you. AMAZING ILLUSTRATIONS! This book would be good from k-5 and it is a powerful lesson that all children should be aware of. Seeds and Trees is a beautiful and necessary piece of literature. Not to be limited to a younger audience, the storytelling is poetic and wise, and the illustrations are absolutely whimsical. He tossed away the bad seeds. My 6 year old liked this story. I liked that his friend the girl was very strong.